A popular outdoor favourite, the Rogue Airhead is a cotton canvas hat with a broad curved brim and ventilated mesh sides. 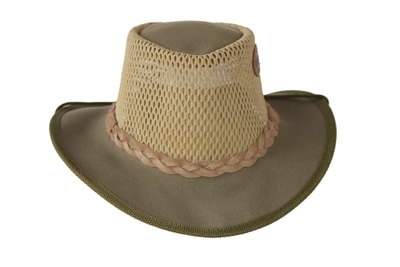 Made from 100% cotton canvas this Rogue hat has a plaited hatband and chinstrap. The Airhead is great for however you spend your time outdoors as it provides ideal sunshade whilst keeping your head as cool as possible with maximum ventilation. The Airhead looks great when worn as a Safari hat, but equally doubles for all types of Bushcraft or camping activities. I originally bought this hat for myself and was so impressed with it that I bought one for my husband too. It keeps the sun off without making your head hot. Simply brilliant. Fast efficient service too.